Wigan chairman Ian Lenagan says Super League has been ‘dumbed down’ by increased funding to the Championship. He believes extra money funneled into the Championship in the last two years, to try and close the gap between the divisions, would have been better spent in Super League. As part of the restructure two years ago - and on the back of a new TV deal - a change was made to the way central funding is distributed to clubs. Instead of receiving around £90,000 each year, Championship clubs got up to £750,000 from central funding, dropping on a sliding scale (the team in 4th receives around £450,000). “I’ve nothing negative against the Championship, but they have spread the money among too many clubs,” he said. Super League clubs receive around £1.825m from central funding each year. That is a similar level to the basic salary cap level, though the Warriors also make use of the marquee player rule - meaning a chunk of Sam Tomkins’ salary doesn’t count on the cap allowance - and prize money received from appearing in the Grand Final can be given to players, outside the wage ceiling. “People are saying raise the cap in Super League... if we had more of the money that has gone into the Championship, we could raise the cap,” continued Lenagan. “Derek Beaumont has done very well at Leigh and we welcome them into Super League - if an owner chooses to get their on his own resources, they’ve got that privilege and ability. “I’ve chosen to spend quite a bit of money on Wigan, as Simon Moran has at Warrington. Lenagan is counting down to his fifth Grand Final in the nine years he has been at the helm of his hometown club. 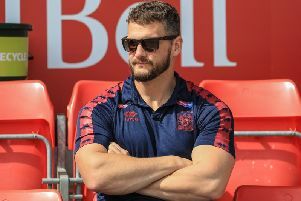 He says their development work, with both homegrown players and ‘project’ signings from other clubs, has been crucial to maintaining their place among the leading pack. This is their fourth successive trip to Old Trafford, which many would consider an achievement in itself - but he has no plans to lower his target of at least one trophy every two years. “Our strategy has kept us within the top 20 per cent of clubs, and we should be winning one trophy every other year,” he said. “This year we’ve missed some big players and yet we finished second in the table, we’re in a Grand Final and we got to a semi-final in the Cup. “Now I hate saying that because we want to win. “We’ve come close this year but I hate coming close. Second in the league is not good enough. A semi-final is not good enough. “And it’s right we have those ambitions - you wouldn’t find Man United or Chelsea or any other big teams wanting to not win things. “I have a passion for Wigan, I’ve been brought up on rugby league and I’m a Wiganer. But my main passion is for success - in business, and in sport. He admits the Warriors’ sticky form in the summer made him doubt whether the 2013 double winners would reach the Grand Final. “There was a period about two months ago, when I wasn’t confident,” he said. “We weren’t playing well, we were losing to lesser teams. “The style wasn’t what it should be, it certainly wasn’t Wigan, and the fans were all a bit worried, as was Shaun. “But since beating St Helens (25-0), and then beating Hull FC and Warrington, that’s serious - that’s not flash in the pan.